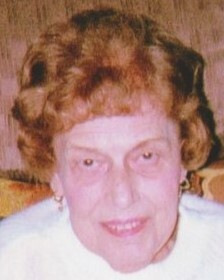 Mary Ann Szabo, 90, of Lorain passed away on Saturday, March 30, 2019 at Elmcroft of Lorain under the care of Crossroads Hospice following a brief illness. Miss Szabo was born in Lorain on May 16, 1928, a daughter of the late John and Rosalia (nee Sifter) Szabo. She was a member of St Francis Xavier Cabrini Catholic Church and a member of the church choir. Miss Szabo retired 20 years ago as a secretary for the former B F Goodrich in Avon Lake following 15 years of service. She worked for many years at the former Fruehauf Trailer in Lorain until it's closing. Miss Szabo enjoyed bowling in her younger years. nephews John A. Caruso of Lorain, James (Lea) Caruso of Sunbury, great niece Sarah Caruso of Boston, MA, great nephews Greg Caruso of Norton, MA and John Michael (Heather) Caruso of Lorain. In addition to he parents she was preceded in death by a brother John Szabo. Burial was in Calvary Cemetery in Lorain. The family suggest that memorial contributions may be made to Crossroads Hospice, 9775 Rockside Rd., Suite 270, Valley View, Ohio 44125 or St. Francis Xavier Catholic Church, 2143 Homewood Dr., Lorain, Ohio 44055. The Schwartz, Spence, Boyer & Cool Home For Funerals is handling the arrangements.